Absolutely beyond doubt Lake Jasper in WA’s South West, D’Entrecasteaux National Park is a magical place. It’s pristine simplicity is breathtaking and I am still feeling the effects of it’s enchantment… but I must stress this won’t be everyone’s cup of tea especially if you like your creature comforts. If you LOVE camping, peace and quiet you will adore this place. I first came across Lake Jasper on a road trip back in May 2016 on my way to Augusta. I finally got to head back here with a mate for a two night stay which was loosely planned, squashed in between other commitments and before we knew it we were off. It’s my kind of road trip – simple, spontaneous and not wanting to know too many details. Just pack and go! For such a tiny destination it was surprisingly diverse and getting there was a mini adventure in itself. Access to the lake requires 4 wheel drive vehicles only (watch the video!!). You can’t get in without 4 wheel so seriously don’t even try. The tracks are boggy and you could easily take a wrong turn resulting in some interesting detours!! When you arrive though….wow…it’s magical. The lake is the largest body of freshwater in Western Australia also know as the “White Water” Lake. In particular, early mornings and at dusk the water has a beautiful glassy hue and on a full moon you can paddle out without a torch! During the day we paddled the whole circumference at a relaxed pace in approximately 90 minutes stopping along the way. It was deceiving as to how small the lake actually is. White sandy beaches are dotted on the south eastern side while the north western side is tree lined along the waters edge, rocky sandbars, muddy shoreline and very windy! It was all awesome and you could get a great SUP workout or take it easy and cruise at a relaxed pace. There are three small basic campsites and fees are payable via an honor system which is collected by rangers of the National Park. The ablutions consist of two unisex drop toilets and are very clean and well maintained. There is a non drinking water tank, outdoor basin and you need to bring drinking water. You are required to take your rubbish with you when you leave as there are no bins, there are no BBQ’s onsite and campfires are not permitted at anytime. There is no fuel stop between Bunbury and Lake Jasper and mobile reception is hit and miss. Sounds all a bit too hard? Not at all. If you’re travelling from Perth bring empty esky’s with you and stock up at the Bunbury Farmers Market on the way. You can get everything you need here at premium quality and reasonable cost including ice. Save yourself the stress of running around in Perth. We worked it out perfectly without wasting any food at the end of the trip. Fuel up again in Bunbury as there are plenty of tracks you might want to explore in the national park. Bring a large container of fresh water for drinking, washing etc. Bring some heavy duty bin bags to secure rubbish. A baby Weber BBQ and small gas stove was perfect to cook meals and boil water. Keep it simple. It’s a simple place and doesn’t lend itself to clutter, noise or chaos. We were lucky to have the place to ourselves except for a few overnighters and pretty much everyone kept to themselves aside from brief polite conversation. It was nice. 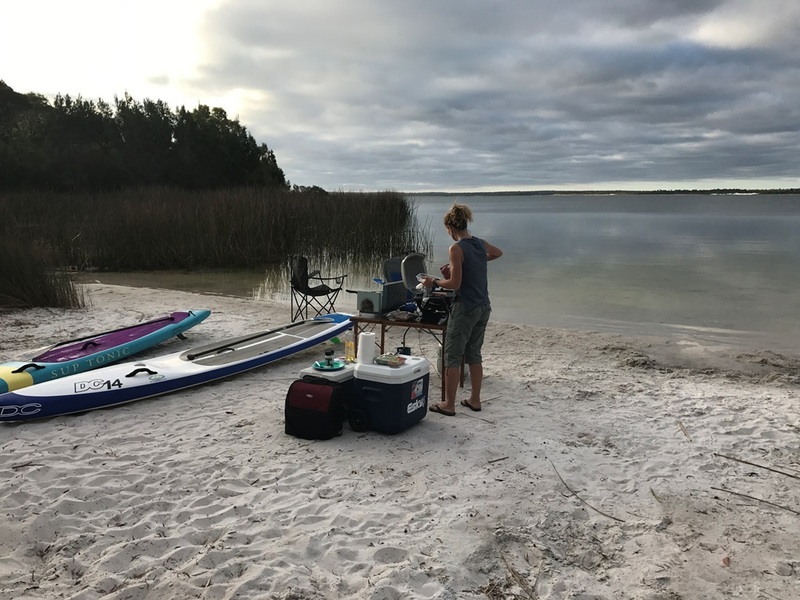 Like minded people wanting to chill out and disconnect, afternoon naps, dips in the lake, preparing meals and watching the sun go down with a few quiet drinks. Our budget for three days and two nights was $300 for two people sharing travel and splitting the cost for fuel, food and park fees ($150.00 each). I can’t wait to return but not sure when. So many other places to explore! Stay posted for road trips notes #5!